The Lionel Ritchie Songbook- Oh What a Feeling! Home » Event » The Lionel Ritchie Songbook- Oh What a Feeling! The Lionel Ritchie Songbook- Oh What a Feeling! will be performed at Carnglaze Caverns on Saturday 28th September at 8pm. ‘OH! 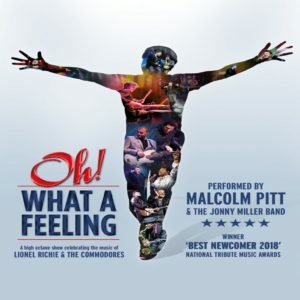 WHAT A FEELING!’ – Winner of ‘BEST NEWCOMER’ in 2018 at the ‘NATIONAL TRIBUTE MUSIC AWARDS’ and voted ‘OFFICIAL UK NO.1’by ‘The Agents Association of Great Britain’ is back in 2019 with a stellar line-up of world class musicians including Talon’s own Jonny Miller and the awesome talent of Malcolm Pitt in this high octane show celebrating the music of Lionel Richie and the Commodores.